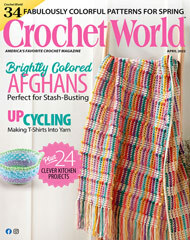 Keep your remote, tv guide, tissues and other accessories nearby with these attractive crochet accessories. This free crochet pattern is easy! Finished Size: Remote Holder: 8 1/2 x 20 1/2 inches; Tissue Box Cover: Fits boutique-style tissue box; Coaster Set: Basket: 3 inches deep x 4 1/2 inches square; Coaster: 4 1/4 inches across.